What Does Code P0442 Mean? This is the heart of the EVAP system – it traps and stores the fuel vapor. The chemical composition of charcoal allows it absorb the vapors then release them when fresh air passes over. This is the part of the system that shuts off the gas pump nozzle when you your tank is full. It is located along the top of the filler neck and provides an expansion space at the top of the tank for fuel vapors. This is the part of the system everyone is familiar with. What most people don’t know is that the cap contains a pressure relief valve, which allows the system to vent in the event of a malfunction. The purge solenoid controls the purge valve based on commands from the PCM. The PCM will typically command the solenoid on when the engine is warm. The vehicle also has to be traveling at a certain speed with the throttle open a specific amount. The Purge valve regulates the flow of fuel vapor from the canister into the engine. On vehicles with enhanced EVAP systems, the vent solenoid is used to seal the system off from outside air. This allows the system to perform its self-test for leaks. What are the common causes of code P0442? A loose gas cap will usually trigger a P0455 code for a large leak instead of a P0422. Even so, it’s a good idea to check the gas cap since it’s easy to do. If your gas cap is loose, tighten it and clear the code. If the code does not return, you’ve solved the problem. Even if the gas cap feels tight, it may not be sealing well. To test the sealing properties of a gas cap requires the use of dedicated emissions test equipment. This equipment is only found in shops, and is not readily available to the do-it-yourselfer. So, if you have any question as to whether or not the cap is faulty, it’s a good idea to just replace it. Caps are generally very inexpensive. Finding a small leak in the EVAP system tubing can be nearly impossible without the aid of a smoke machine. The professional versions of this machine are expensive, but a quick Google search will reveal ways to make your own at home. 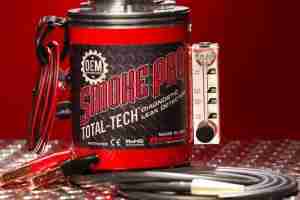 A smoke machine works by pumping fine mineral oil into the system under pressure. The smoke circulates through the system and eventually seeps out through the leak, making it visible. Before running this test, you will need to make sure both the purge and vent valves are closed. This is most easily accomplished using a bi-directional scan tool. Having a high-end scan tool helps EVAP diagnosis immensely. Scan tools with bi-directional controls often have a dedicated EVAP leak test. To determine if you actually have a problem with the EVAP system, clear all DTCS and run the test. With just a push of a button, this test seals the system and tests for a leak. After the test has run, the results will be displayed on the scan tool screen. If there is a leak, the code will also reappear after the test is run. Once again, this will usually result in other EVAP codes – not just a P0422. But, if none of your testing has proved successful so far, you may want to take a look at the purge and vent valves. The best way to test these valves is with a scan tool. Start by connecting the scan tool to the OBD port. Looking through the live data you will find a PID for the purge solenoid status. At idle, the purge solenoid should be off. It should remain that way until certain conditions are met while driving. Purge solenoid valves can be further tested using a handheld vacuum pump. Consult the service information to determine whether the valve for your vehicle is normally open or normally closed. A normally open solenoid will permit vacuum when de-energized. A normally closed solenoid blocks vacuum until it’s activated by the PCM. Next, test the vent valve and its control circuit. The vent valve is usually open, but the PCM closes it when it is testing the system for leaks. Using a bi-directional scan tool, you can command the valve closed and see if it responds or not. 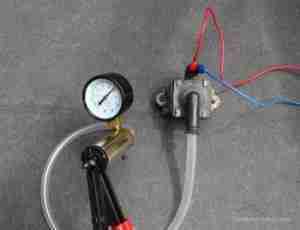 You can also test the valve in a similar fashion to the way the purge valve is tested. First, connect a handheld vacuum pump to the vent valve. Then command the vent valve closed with a scan tool – or by jumping it to power and ground. If the valve is sealing, there should be no drop on the vacuum gauge. How do you troubleshoot code P0442? 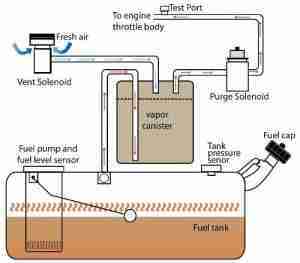 This type of system primarily uses a fuel tank pressure sensor with vent and purge solenoids. It was designed to find small leaks consistent accuracy. When the engine is turned off, the valve is commanded closed by the PCM, sealing the evaporative emissions system. If the ambient temperature changes and the PCM does not detect any change from the fuel tank pressure sensor (FTP), the PCM decides there is a small leaks and sets the corresponding code. This type of system uses an electric pump to pressurize the system. Whether or not the system has a leak is determined by a fuel tank pressure (FTP) sensor reading reported back to the PCM. Or, in some cases, the amount of current the pump uses may be measured for testing. This system uses a dedicated PCM leak detection pump (LDP) to test the EVAP system. A pressure sensor and vent-solenoid are not needed. The LDP fills both roles, and creates the pressure for testing. If during self-testing using the LDP, the system cannot reach a pressurized state, the PCM assumes there is a large leak. The PCM also measures the time it takes for the pressure to drop. In Chrysler systems for example, a large leak generally requires 1.2 seconds to pass and a small leak need about 6 seconds. The difference between this code and other leak codes – such as P0455 – is the size of the leak. While P0455 indicates a large leak, our case study P0442 indicates a small leak. In most cases, P0442 indicates a leak no bigger than a pin prick, which translates to.020-.060 inches of vacuum. Because the leak is so small, it can be very difficult to locate and diagnose. P0442 "Evaporative Emission System Leak Detected (small leak)"
I Have A 2003 Buick Park Ave An Have Been Getting P0442 Several Times.The Purge Valve Has Been Replaced Do Yoy Have Any Ideas On The Problem?